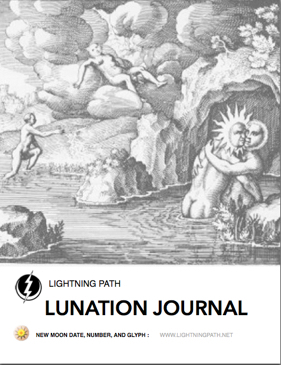 The Lightning Path Journal is offered up as a contemplative tool specifically geared to those persons interested in exploring more deeply, what the Lightning Path is all about: inner work. The journal has been designed in an 8.5 in. x 11 in. format and is available as a free, page-by-page, printable download by clicking here. Want to know more about the lunation cycle and its inner structure? Click here. Current lunation phases are also conveniently displayed on the Khaldea Astrological Calendar. Handy lunation phase charts are also available here.